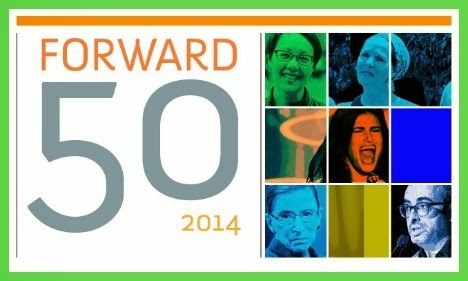 One of The Forward's 50: For the last 20 years, the Jewish Daily Forward has published a list of "the 50 American Jews who have had the most impact on our national story." Could This Be the Year of the Jewish Woman? Never in the 50's history has the number of women on the list been this high — 26 in all, including four of the top five. Even we were surprised at the final tally. While women have yet to be accepted (and paid) on an equal footing with men in organized Jewish communal life, they are taking leading roles in influencing national policy, cultural norms, religious practice, literature, political advocacy, the performing arts and the ever-fraught conversation about Israel. Abq Jew is honored to introduce one of these remarkable women to you. As senior cantor at New York’s Central Synagogue, Angela Buchdahl was known to team up with one of her colleagues to perform a “mash-up” — an artful blending of two thematically linked but musically distinct songs. Hatikvah was woven into America the Beautiful. For Passover, the two cantors combined Dayeinu with the spiritual Oh, Freedom. The unusual pairings are emblematic of Buchdahl herself, who seems to effortlessly embrace her many dual identities and heritages: rabbi and cantor; Korean Buddhist and Ashkenazi Jew; a person who has shattered glass ceilings and quietly works to uphold tradition; who sends her three children to Jewish day school and puts kimchi on her Seder plate. Her rising star within the Reform movement was catapulted even further this year when she became the first woman to be named senior rabbi at Central, a huge, fancy and immensely popular and influential synagogue on Manhattan’s Upper East Side. said Rabbi Rick Jacobs, head of the Union of Reform Judaism and her mentor when both were at Westchester Reform Temple. Central is transforming the way people experience Jewish life, cultivating ongoing exploration, and pursuing a powerful vision for the role of Judaism in the world. 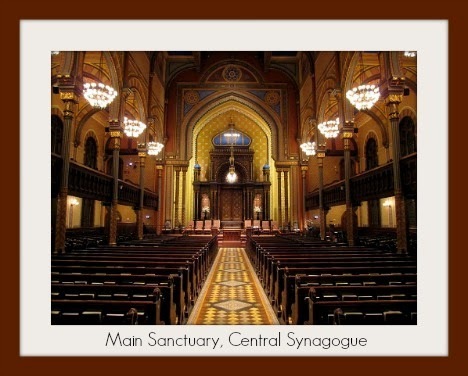 The Central Synagogue (Congregation Ahavath Chesed) is located at 652 Lexington Avenue on the corner of E 55th Street, Manhattan, New York City, New York. Built in 1872 in the Moorish Revival style as a copy of Budapest's Dohány Street Synagogue, it pays homage to the Jewish existence in Moorish Spain. It has been in continuous use by a congregation longer than any other in the city. The building was designed by Henry Fernbach. The dramatic style of the building was the subject of much debate during the construction. Some felt its excess would inspire envy and stand in the way of assimilation. It is among the oldest synagogue buildings still standing in the United States. It was designated a National Historic Landmark on May 15, 1975. On Wednesdays at 12:45 pm a docent conducts a free tour, which begins at the front entrance. The building was restored by 2001 in the original style after an accidental fire in August 1998. The roof and its supports were destroyed as a result of the fire. During this fire, the firefighter's sensitivity for the building saved all but the central pane in the rose window that dominates the eastern (Lexington Avenue) wall. The marble plaques on the north wall of the foyer honor the firefighters of the 8th Battalion of the New York City Fire Department. Has an operations and events staff of 26, plus 100 "additional" employees. Hosts up to 1,250 annual internal, congregant and non-profit events. Has over 8,000 congregants (2,300 households). Has an operations and events budget of $3 million. Earlier this year, the Central Board voted to allow associate members to become full members, and to discontinue the associate status. Instead, once Central reaches its new capacity of 2,300 households, prospective members will be placed on a simple waiting list and offered membership as space becomes available. Double your Shabbat celebration! Daven at Central, then daven at your favorite New Mexico synagogue or alternative prayer forum! What's Unnerving About Angela Buchdahl? 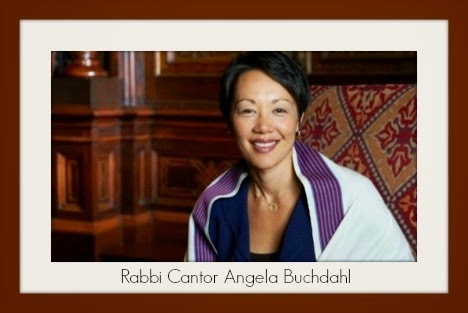 What has made some people nervous about Angela Buchdahl becoming the senior rabbi at Central Synagogue – one of the two largest Reform synagogues in New York and one of the biggest in the United States – is not that she’s the first Asian-American rabbi. It’s not that she’s a woman or, at 41, so young to lead a congregation whose membership will soon number 2,400 families. It’s not that she’s been working primarily as a cantor for most of her career. It’s not even that she’s the mother of three young children, though that has given some in her congregation pause, Buchdahl said. No, it’s because she talks about God. Other Jewish communities are not reaching them. “I have a friend in Laramie, Wyoming, who watches us and said, ‘You are our Jewish life,’” Buchdahl reveals. Here, for your enjoyment and fascination and education, is The Hope - the sermon that Rabbi Cantor Angela Buchdal delivered at Central Synagogue on Yom Kippur 5775. Abq Jew must tell you: The Hope is 25 minutes and 34 seconds in duration. The time will fly by. Pay full attention, and stay till the end. Your reward will be great.